This is really useful. do you plan to release your code via github? No, I do not publish my code. Could you please create a special alert for flash sales? I mean, there are already flash sale servers listed there but what if a new flash sale with a price never saw before appears? OK. I'll make a section for the new Flash Sale. The problem is that the server codes change each time for Flash Sale. But you don't need to alert for an specif server offer, you just need to alert when flash sales starts. I got it, I'll do it one of these days. I just found your site but It won't let me select any of the check boxes. How do I use your site please? You must first sign up for the mail. Then go to the link and all the checkboxes will be available. Great service. But after signup, how do I add more servers to the list? The link in your email just goes to a blank list at https://checkservers.ovh/. How do I retrieve the previous list? Thanks. You need to follow the link and select the necessary servers. The old server line was hidden because it lost its relevance. If it is not too much to ask, is it possible to add this server from OVH? I will add in the future. 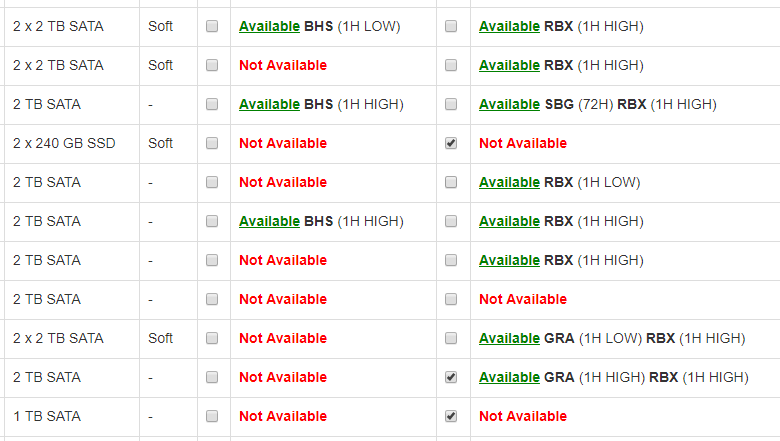 OVH has a lot of servers on the main line. But as an OVH reseller, I see that there are not always servers on the main line. The same Singapore is not always available and so on.